Creating beautiful Westchester Wedding Photography is easy with so many exquisite venues to experience. Among these are Chateau Hathorn, Eagle's Nest, Kirby Hill Farm, Monteverde at Oldstone, New York Country Club, Salem Golf Club, and the Garrison. Westchester is a county of New York state, located in the Hudson Valley region. The county is home to the widest portion of the Hudson River, an area once called the Tappan Zee or Sea. This nickname led to the official naming of the Tappan Zee Bridge, which spans the river and brings travelers into Tarrytown, NY. The scenery of any Westchester wedding is exceptional, with a plethora of forest areas and waterfront views that make for memorable Westchester Wedding Photography. This photo show a bride and groom sounded by the natural beauty of the area. They stand together in a secluded wooded spot, giving the appearance that they are the only two people for miles. The black and white coloring of the picture gives it a dramatic ambiance. The sky behind the couple is smudged with clouds and is covered by the branches of trees that tower over the scene. 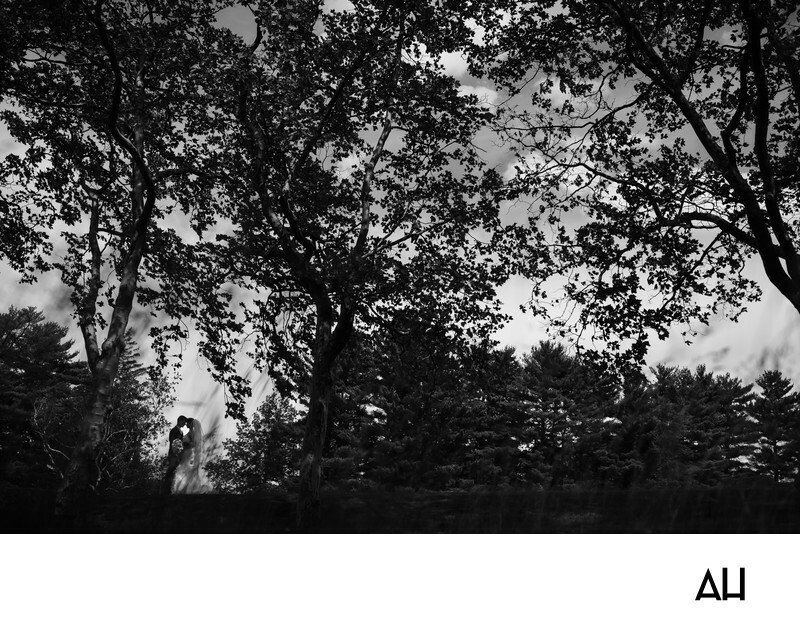 The bride and groom appear small in size, compared to the trees that surround them. It is as though they are a fairy prince and princess meeting in the woods for a royal wedding. Shadows dance over the bride’s white gown giving the impression that it is blending into the clouds behind her. The groom holds her tight, keeping her here on earth and not allowing her to float away. The newlyweds stand in tranquil happiness, foreheads touching, as they take this moment to just be with one another, reflecting on their magical day.